Stream it before its release! Editor's Note: This review was written while seated at the corner of a bar right on the Mystic River in beautiful Somerville, MA. It is an outdoor spot where the trees all around are currently a bright orange hue. Sit back, relax, and remember a time when your old Abercrombie T-shirts and Chuck Taylors fit just right. Things were exactly where they needed to be in the crazy, mixed-up life of adolescent America. You had your books, your friends, and your prized Mp3s to tide you through the rigors of your school day. If you were a fan of such shows as The OC, bands like Nada Surf were the backbone of many playlists that you made back in the early 2000s. Nearly two decades later, the venerable California quartet is still going strong, especially with the release of their new live disc, Peaceful Ghosts. Peaceful Ghosts combines the band’s sunny-day power-pop sound with the serenity of the Babelsberg Film Orchestra, fitting perfectly into the kind of soundtrack that you wanted in all the "indie" films of the band's prime release era. 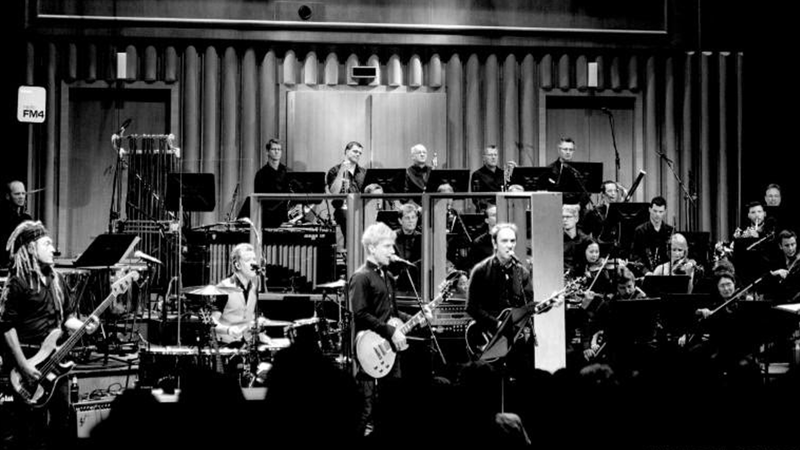 Included in this set are some of Nada Surf's most beloved songs, but with the full faith and credit of the symphony’s sound. Among the highlights of the live orchestral disc is “Blonde on Blonde” which brims with a horn section accompaniment that no one ever knew that the song needed back in 2002. The Babelsberg Film Orchestra (affiliated with the Babelsberg Film Studios, where movies like The Blue Angel and Metropolis were made) truly gives these (and this is said without any disrespect) shining pop songs an added dimension. Think about some of the great 1960’s pop symphonies that are synonymous with the genre. Pet Sounds is chief among them and this Nada Surf live effort brings new life to it. “Inside of Love” is given a cinematic hue that it has always deserved since its younger days. Matthew Caws’ vocals make the track, which has been featured everywhere from How I Met Your Mother to One Tree Hill, feel like it's been put to wax for the very first time. “When I Was Young” soars from its first showcase on The Stars are Indifferent to Astronomy in 2012 to incredible heights today, with conductor Scott Lawton's musicians acting like wings for the song to glide on. This, paired with the track's quiet exposition makes it such a slow burner. F. Scott Fitzgerald once said that there is no such thing as second acts in American lives. Nada Surf has proved time and time again that they are more than the band that created kitschy pop like 1996’s “Popular” or their OMD cover popularized by Fox’s hit TV series'. This set proves that they are much more than any preconceived notion of what they once were. Yes, they keep producing the same great power pop that fans have known and loved. Now, though, they are doing it with craftiness, the help of an iconic symphony, and with new emotion. Peaceful Ghosts drops on October 28, but you can stream it exclusively via the Wall Street Journal right now! Track Nada Surf on Bandsintown to stay up to date with all their tour news.